As a boy, Soros was a Nazi sympathizer during WWII, and the rest of his adult life he’s maintained intimate ties to Socialism and Communism. Furthermore, Soros is often viewed or perceived as the “front man” for many of the other uber elites around the world, many of whom are members of exclusive secret societies including as the Bilderberg Group and the Illuminati. In the other camp, are those who value freedom, liberty, and free market capitalism, and they therefore see George Soros as an “untouchable terrorist” because of his wealth and power. 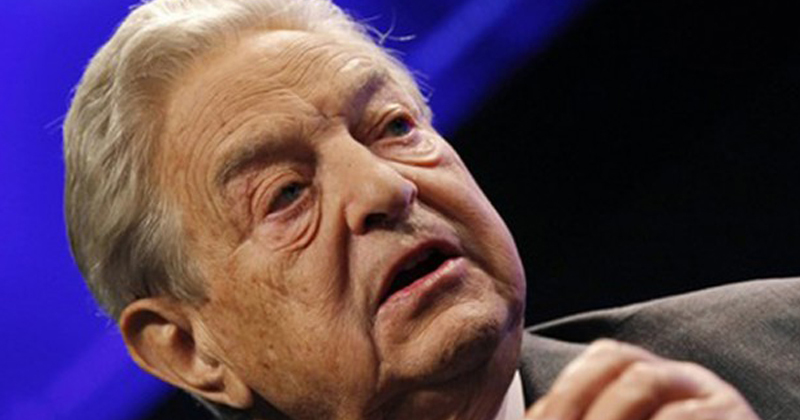 George Soros is the man behind the heinous organization moveon.org, and in recent years has funded uprisings and riots at events including those in: Ukraine, the Arab Spring, Ferguson, Baltimore, Occupy Wall Street, and most recently Soros is bankrolling the wretched group Black Lives Matter, as well as the group “Democracy Spring,” which is promising to bring about the “largest civil disobedience action of the century” if they don’t get their way in the 2016 elections. Anyone recall if there was any violence or deaths at the aforementioned events? Exactly! As far back as when Soros was a young man during Nazi occupied Hungary, Soros always traded currencies on the black market. Gradually, over the years, while mastering his craft, Soros became one of the wealthiest men on earth in the process. During that period, he’s come to be known in global currency markets as, “The Currency Killer.” That will be important later. For now, just realize that George Soros’ primary business is importing chaos into regions he needs destabilized for his own personal gain. Based on that premise, it should be easy to understand what Alex Jones is talking about in the first video below, which is how the CIA has tied Soros, who happens to be a HUGE Hillary Clinton financial backer, with having ties to a terrorists. As you read this post, keep in your mind that THIS is the company Hillary Clinton and Barack Obama have long ben in bed with politically, and funded by in many of their exploits. Obama is a Soros favorite. “Terrorism” is nothing new to George Soros, it just isn’t called “terrorism” when he does it. As an example of Soros terrorism, now would be a good time to mention that in addition to financing people to riot at the places mentioned above, Soros and Hillary Clinton were actually the ones behind all the anti-Trump rallies, and the violence that came with them. It was later discovered after the media had spun its false narrative, that the protestors were being paid $16 per hour to show up and cause chaos. They didn’t have a beef with Trump. They were paid to be there. This isn’t rocket science. Using violence, and threatening to carry out the “largest civil disobedience action of the century” if “Democracy Spring” doesn’t get their way in the 2016 elections, is a textbook example of “using terror in the pursuit of a political aim.” If you doubt that that it should be called terror, might I suggest questioning some of the dead from previous Soros funded events, and see if they agree with me or you. Let me know how that goes. Don’t think Soros is limited to importing chaos into just U.S. politics either. As the “front man” for the Bilderberg Group and the Illuminati, George Soros is very open publicly about his desire for one world government, and has even admitted to helping fund to facilitate the process. George Soros has been a long time ally of both Hillary Clinton and Barack Obama. His alleged ties to a terrorist act should not surprise anyone. Unbeknownst to so many Americans, Soros funds virtually all left wing/Communist uprisings, and is virtually always the money behind poetical agitators here in the United States. Sadly, because the mainstream media is so dishonest and so corrupt, the typical American voter has no idea that events the “presstitutes” report as “spontaneous, with no organization or funding” are normally quite the opposite. They are highly coordinated, and very well funded efforts, with Soros usually behind them. If Americans are smart, they’ll take this information about Soros’ alleged ties to a terrorist act, and combined with all of Hillary’s other shady dealings, they’ll be able to deduce there is no way that woman is fit for President. For anyone who just can’t seem to break away from supporting Hillary, might I suggest reading, Why Did Illuminated George Soros Liquidate 37% of His Stock to Buy Gold? (Video). Recall up above I said that Soros’ nickname for years has been, “The Currency Killer,” right? With all you SHOULD know about the problems in the U.S. economy, why would Hillary be so closely associated with one of the richest men on earth (and a man nicknamed “The Currency Killer”), who also just happened to bet for the whole world to see, that the U.S. Dollar is is about to collapse?